Egyptian Nubian activists announced on Thursday not to renew their two-week-old protests against the sale of Nubian land in the areas of Toshka and Forkund in Aswan to non-Nubians for one month after the prime minister and parliament speaker promised to study their grievances. Marathon meetings, which lasted for a total of seven hours, were held on Wednesday between the Nubian-Egyptian activists and PM Sherif Ismail and parliament speaker Ali Abdel-Aal were held in Cairo at both the Cabinet and the parliament headquarters. The Nubian activists demanded the government stop the planned sale of 110,000 feddans of Toshka and Forkund land as part of its "New Valley Project" of economic development in the south. The New Valley Project, also known as the Toshka Project, aims to build a system of canals to irrigate parts of Egypt's Western Desert. On Wednesday, Egypt's prime minister and parliament speaker agreed to form a committee which includes cabinet members, Nubian activists and MP Yassin Abdel Sabour of Aswan governorate to revise maps for Toshka and Forkund, and remove the areas from the project. Parliament speaker Abdel-Aal promised the Nubian activists parliament would discuss a draft law of Nubian resettlement and development, but did not specify a timeframe. "Tomorrow and next week we will hold a meeting with other Nubian activists across the country, starting with those who reside in Alexandria, to discuss the latest developments and next steps" Abdel-Aal said on Wednesday. "We decided to suspend the [protests] for one month," Mohamed Azamy, the head of the Nubian Union and one of the organizers of the sit-in, told Ahram Arabic news website on Thursday. "After that, there would be an escalation in our protests," Azamy added. On 19 November, a group of Egyptian-Nubian activists blocked the Abu-Simbel –Aswan highway in Aswan governorate for four days to protest the government's decision. 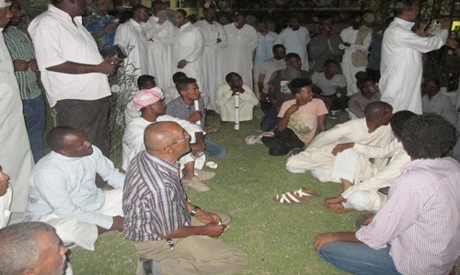 The activists sit-in was suspended on 23 November following meetings between Nubian activists and officials in Aswan. In Wednesday's meetings, the Nubian-Egyptian activists also demanded an amendment to Presidential decree 444 - which designated areas along Egypt's southern border as military areas - to allow the return of Egyptian Nubians to historic villages. However, the parliament speaker said 444 was a "sovereignty decision" by the president and a question of "national security", and therefore, could not be discussed by parliament. "We also demanded that parliament begin a discussion on a draft law of Nubian resettlement and development in the current parliamentary year," Azamy told Ahram Online. In 2014, a draft law to develop Nubian communities and resettle those displaced by the construction of the Aswan High Dam in the 1960s per the 2014 Constitution was prepared by the cabinet of then-prime minister Ibrahim Mahlab, but has not been submitted to parliament.